This conference, held May 3-5 in Abu Dhabi was focussed on building robust and workable climate finance mechanisms that will secure developing country participation, support sustainable development, and leverage cost-effective solutions to mitigating climate change. Successfully meeting the challenge of climate change is not only an environmental imperative, but also a huge economic challenge as well as potential economic opportunity. It will require both a new global agreement to succeed the Kyoto Protocol and new financial arrangements to generate swift large-scale investments in mitigation efforts—by 2030, an additional USD 100 billion annually will be required for mitigation in developing countries. Yet the financial mechanisms that currently exist as part of the UNFCCC, the Kyoto Protocol and elsewhere are not up to the task of delivering either this level of funds or associated technologies in ways that will successfully engage developing countries and further their development. This conference addressed the structure, regulation, and governance of the various existing and proposed new forms of climate mitigation finance, with a focus on their implications for developing countries. 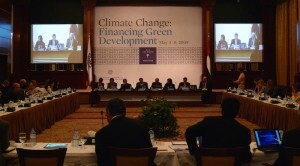 The conference engaged a select group of high level developing and developed country policy-makers and academics, representatives of the climate finance industry, multinational businesses, international organizations, and NGOs.